Safety is a global, national, regional, and local phenomenon. The U.S. is no more immune to acts of crime or violence than other parts of the world. While no study abroad program can absolutely guarantee that students will be safe, many steps that can be taken to reduce the risk of injury or falling victim to crime. Please read through the following safety suggestions in order to better prepare your student in the case of health or safety challenges. Prior to leaving the country, our office meets with all the students who are studying abroad for a mandatory orientation to speak about issues regarding: Visas, securing classes, health and safety, and cultural differences. The students will also have an opportunity to speak with Study Abroad Alumni who attended their program in the semesters prior. Our office is dedicated in providing the comprehensive information to prepare your students to study abroad. Parents, students, and study abroad programs all have a role to play in maximizing safety abroad. • Conduct a periodic assessment of safety conditions at the site. • Provide safety information to prospective applicants so that they can make informed decisions concerning participation and concerning their behavior while on site. • Provide an orientation to participants in order to help them improve their avoidance of high-risk situations and their skills in dealing with problematic events. • Monitor the local environment and provide safety updates to participants. • Take appropriate actions in the event of a serious deterioration of the local safety environment. • Assist participants should a serious safety issue come to the attention of the local personnel. • Evaluate the safety issues surrounding program events, excursions, or other services, whether arranged by the provider or by a third party. • Provide referrals for appropriate medical, legal, psychological or other professional assistance for participants experiencing difficulties. • Make information available to students concerning health and travel insurance. • Submit to the Center for International Programs at SMC, or to the study abroad program provider, health and psychological information, or any other information, that will be useful in planning for the participant's experience abroad. • Make personal decisions and conduct his or her private life in an intelligent fashion, paying particular attention to local conditions as outlined by the program and as observed by the participant. • Assume responsibility for the consequences of his or her decisions and actions. • Purchase and maintain appropriate insurance policies and abide by the conditions imposed by the carriers of such policies. • Abide by the Student Code of Conduct distributed by the Center for International Programs. • Obtain and evaluate safety information concerning the study abroad location. • Be involved in the decision of the student to participate in a particular program. • Engage the participant in a thorough discussion of safety and behavior issues related to the program overseas. • Contact the program operator and/or Saint Mary's College with health and safety related questions. • Assure that risk abroad will not be greater than at home. • Monitor the daily personal decisions, choices, and activities of individual participants. • Stand in place of parents. • Prevent participants from engaging in illegal, dangerous, or unwise activities. • Represent the interests of participant’s accused of illegal activities. • Assume responsibility for the actions of persons not employed by or otherwise engaged by the study abroad program operator. • Assume responsibility for events that are beyond the control of the provider and its subcontractors. • Assume responsibility for situations that arise due to the failure of a participant to make full disclosure of pertinent information prior to departure. • Assure the adherence to U.S. norms of what is appropriate and acceptable behavior in matters of due process, individual rights, "political correctness," sensitivity to others, relationships between the sexes and among diverse racial, cultural, and ethnic groups. Students should exercise the same good judgment regarding personal property and safety abroad that they would at home. Students should not hesitate to ask the CIP for assistance regarding security. Your student is expected to behave in a way that is respectful of others’ rights and well-being. The CIP staff tries to provide as much information as possible, but it is the responsibility of your student to be aware of rules and regulations of the study abroad program, and the local laws and customs of his or her host country. Students not only have to conform to the legal system of the country they will be visiting, but also obey any code of conduct required of program participants. If an emergency occurs overseas, your student should contact on-site staff. If on-site staff cannot be reached, he or she should call the emergency numbers provided to your student during the on-site orientation at the beginning of the program. Local staff can help your student contact you as well as keep you updated if your student is unable to speak with you directly. If an emergency occurs at home, you should contact the Center for International Programs at Saint Mary's College. If our office is closed, please call Public Safety at 925-631-4282. • Leave an itinerary with host families or with family in the US. During the semester, students should leave travel/itinerary plans with staff at the host institution. • Consult with the American Consulate website about any travel plans. Pay close attention to travel advisories. • The Citizen’s Emergency Center at the US Department of State provides taped messages with the latest travel advisories at 202-647-5225. The Citizen’s Emergency Center at the Department of State will also help find you overseas in an emergency. All study abroad students must be enrolled in overseas health insurance that will provide sufficient coverage for them for the duration of their program abroad. SMC-Sponsored and Lasallian Consortium programs offer health insurance at no extra cost to the student, or Saint Mary’s will purchase health insurance on behalf of the student. Students participating in Exchange programs are responsible for purchasing their own health insurance, and the CIP can help facilitate this. Student participating in Non-SMC programs are responsible for either purchasing their own insurance or verifying that health insurance is included with the cost of the program. 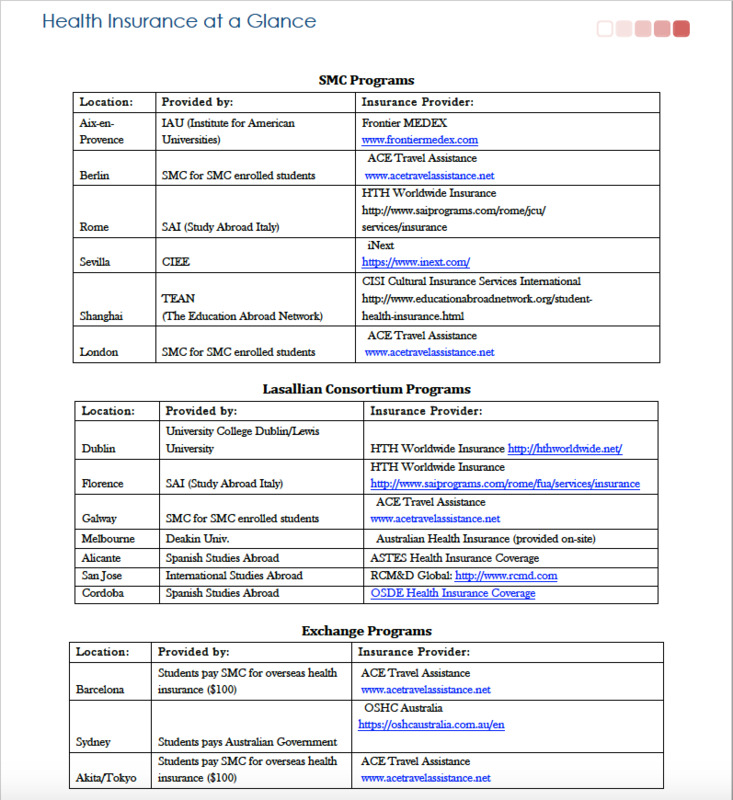 Please see the Health Insurance at a Glance** for more information on health insurance providers for each program. TRAC works directly with the Center for International Programs (C.I.P.) and the Jan-term Committee to review international travel courses, learning opportunities, and other global activities. TRAC also works with the Health and Wellness Center to coordinate all health-related tasks such as immunizations. Questionnaires designed to identify risk factors are included in proposals. This information is the basis of TRAC review and assessment. With the information provided and obtained from travel questionnaires and applications, TRAC maintains a robust, automated database that can be used to immediately and efficiently monitor and contact SMC travelers according to their itinerary in case of emergency. In rare and extreme cases, TRAC considers extraordinary circumstances such as political unrest, terrorist activity or health conditions that pose potentially serious harm by consulting appropriate sources such as the U.S. State Department, Center for Disease Control, professional organizations and various reputable news media to make informed recommendations related to policy decisions in collaboration with SMC administration.